colorpicker is a jQuery Color Pickers plugin. evol.colorpicker is a web color picker which looks like the one in Microsoft Office 2010. It can be used inline or as a popup bound to a text box. evol-colorpicker is a web color picker which looks like the one in Microsoft Office 2010. It can be used inline or as a popup bound to a text box. It comes with several color palettes, can track selection history and supports "transparent" color. It is a full jQuery UI widget, supporting various configurations and themes. Check the online demo for several examples. Download or fork evol-colorpicker at GitHub. Using the same syntax, the widget can also be instanciated on a <div> or a <span> tag to show inline. In that case the generated HTML is the full palette. evol-colorpicker is as easily themeable as any jQuery UI widget, using one of the jQuery UI themes or your own custom theme made with Themeroller. Used to set the color value. 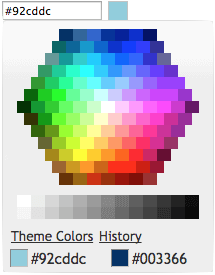 Used to set the default color palette. Possible values are "theme" or "web". 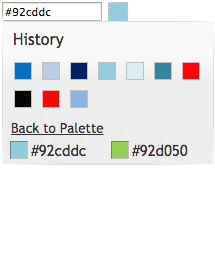 Used to show color value on hover and click inside the palette. When binding the colorpicker to a textbox, a colored button will be added to the right of the textbox unless hideButton is set to true. This option doens't have any effect if the colorpicker is bound to a DIV. Used to track selection history (shared among all instances of the colorpicker). The history keeps the last 28 colors selections. Used to provide a color selection history. Colors are provided as strings of hexadecimal color values. Have the colorpicker appear automatically when the field receives focus ("focus"), appear only when a button is clicked ("button"), or appear when either event takes place ("both"). This option only takes effect when the color picker is instanciated on a textbox. Used to translate the widget. It is a coma separated list of all labels used in the UI. strings: "Couleurs de themes,Couleurs de base,Plus de couleurs,Moins de couleurs,Palette,Historique,Pas encore d'historique." 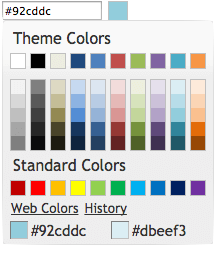 Defaults to "Theme Colors,Standard Colors,Web Colors,Theme Colors,Back to Palette,History,No history yet.". Allow for selection of the "transparent color". The hexadecimal value for the transparent color is "#0000ffff". Clears the color value (and close the popup palette if opened). Get the currently selected color value (returned as a string). Get or set the currently selected color value (as a string, ie. "#d0d0d0"). Show the palette (when using the widget as a popup). Hide the palette (when using the widget as a popup). This event is triggered when a color is selected. This event is triggered when the mouse moves over a color box on the palette. Copyright (c) 2017 Olivier Giulieri. evol-colorpicker is released under the MIT license. This is yet another colorpicker plugin for jQuery since most of them are not on GitHub nor being mantained at the moment.